The analytical repertoire of BEVITAL is composed of methods based on cutting edge analytical technology. Most assays are developed by scientists and technicians at BEVITAL with more than 20 years experience in gass-liquid chromatography and/or mass spectrometry. One dedicated scientist is responsible for each platform, its upgrade, performance and ruggedness. Such long-term experience enables the prevention of common mistakes, including unrecognized assay interference and matrix effects (ion-suppression). Some unique products and news are summarized below. Stability curves. Data on the stability during storage and freezing/thawing of most biomarkers or metabolites included in the repertoire of BEVITAL by April 2019 is now available. Inflammation markers, cystatin C and its proteoforms in 20 µL of sample. A new method (platform G) for the combined quantification of C-reactive protein (CRP), serum amyloid A (SAA), and calprotectin (S100A8/9) and the kidney function marker, cystatin C (CysC), and a number of proteoforms (11 for SAA, 4 for S100A8/9 and 4 for CysC) has been developed at BEVITAL. The method is characterized by low sample consumption, high capacity, and high precision, and has been designed for the assessment of biomarker status in precious samples from large biobanks. Saving biobank material by combining platforms. 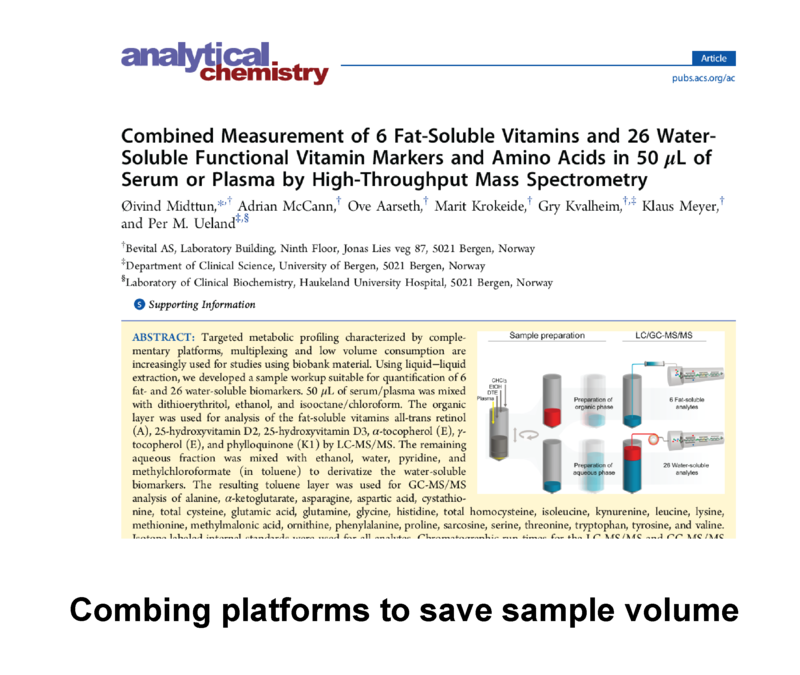 A procedure involving combined sample workup for platforms B and H enabling quantification of 6 lipid-soluble and 26 water soluble biomarkers in 50 µL serum/plasma has been established. The method utilizes liquid-liquid extraction of the lipid soluble vitamins and further processing of the aqueous phase through the steps established for platform B. Recovery of degraded biomarkers. The combined measurements of the degradation product and parent compound may correct for moderate biomarker decomposition. Such recovery assays have been validated and published for the conversion pyridoxal 5'-phosphate (PLP) to pyridoxal (PL), flavin mononucleotide (FMN) to riboflavin, for the oxidation of methionine to methionine sulfoxide and for the oxidation of 5-methyltetrahydrofolate to 4-alfa-hydroxy-5-methyltetrahydrofolate (hmTHF). In samples where folate has been extensively degraded beyond hmTHF, folate can be measured as p-aminobenzoylglutamate (pABG) equivalents by an assay involving oxidation and mild acid hydrolysis. 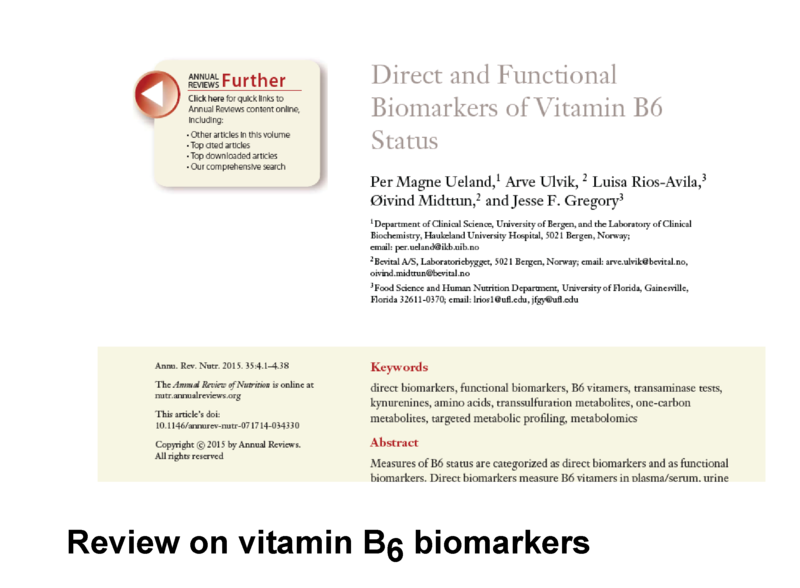 Vitamin and biomarker status across countries and continents. 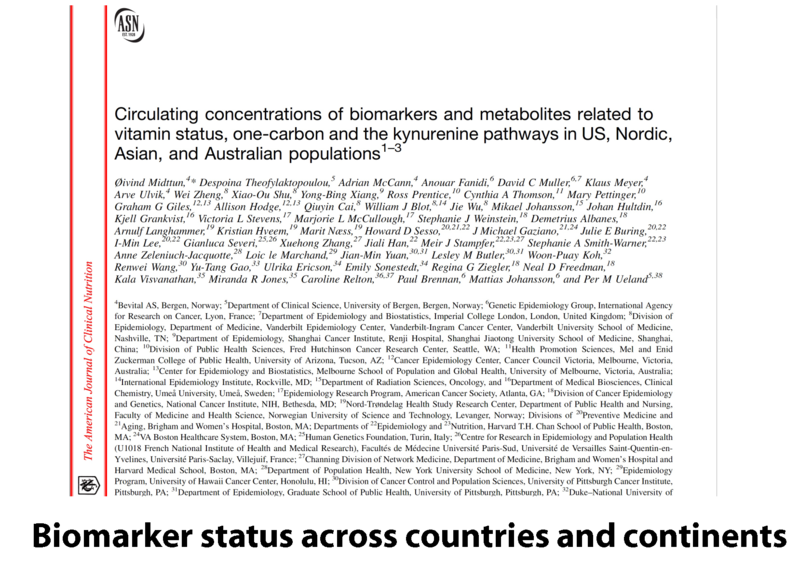 Biomarkers that are related to vitamin status, nutrition, inflammation and lifestyle have been measured in subjects from 20 cohorts recruited from the United States, Nordic countries, Asia, and Australia, participating in the Lung Cancer Cohort Consortium. The biochemical analyses have been carried out in a centralized laboratory, i.e. BEVITAL. - Assessment of the approximate metabolite concentrations in representative extracts. Initially, the customer must provide representative extracts. This will be used to determine the approximate concentration of metabolite. Such information is required for method validation (steps 2 to 3). - Metabolite extraction including protein precipitation. Preferably, the extraction should be carried out using the same procedure and precipitating agent as used for the method optimized for serum/plasma. Extraction could be carried out by the customer according to agreed procedure. Alternatively, extraction of frozen cell pellet or frozen tissue specimen could be carried out by BEVITAL. In both cases, the extraction solution (trichloric acid or perchloric acid) should be supplemented with deuterated internals standard for each metabolite, the concentration of which must be similar to the concentration of each metabolite, as obtained in step 1. The stability of the metabolite prior to extraction is the responsibility of customer, but if rapid changes in concentration are expected, BEVITAL recommends freeze clamping of tissue or treatment cell pellet with liquid nitrogen. Metabolite stability after protein precipitation in extraction solution is expected to be similar for serum/plasma, cells and tissues. Interference from endogenous compounds may differ between different sample matrices. Interference will be considered by inspection of elution profile, mass fragmentation pattern and comparisons of different ion pairs. - Linearity and dynamic range. Assessment of linearity is obtained by serial dilution of the extract up to about 30-fold dilution or until Lower Limit of Detection (LOD). In addition, a standard addition procedure should be carried out by adding unlabelled metabolite to obtain a final metabolite concentration of 2 to about 30 times the endogenous levels. An indication of linearity will be obtained by plotting the ratio of ion intensity of metabolite and deuterated internal standard versus dilution for both experiments. - Analytical recovery and ion suppression. A measure of analytical recovery will be obtained by comparing metabolite concentrations from the standard addition experiment with concentrations detected by adding the same amounts to the extraction solution, assuming 100 % recovery in the absence of cell/tissue components. Comparison of the absolute ion intensities of metabolites with and without cell/tissue extraction, will give a measure of ion suppression. A 3 points calibration curve covering expected metabolite concentrations will be set up either by adding metabolite to the extraction solution, or, in case of substantial ion suppression (> 50 %) or low analytical recovery (< 70 %) to a cell/tissue extract (standard addition method). - Precision of the assay. If requested by the customer, assessment of within-day and between-day precision of the method will be done. The cost for validation and optimization may be difficult to predict, must be covered by customer, and is calculated from man-months required to accomplish tasks 1 to 8. The current rate is 12000 EURO per man-month. BEVITAL is partner in numerous projects. These include two EU projects, “Metabolomic profiles throughout the continuum of colorectal carcinogenesis” (MetaboCCC) and ”Biomarkers related to folate-dependent one-carbon metabolism in CRC recurrence and survival” (FOCUS), and one large multicenter study on lung cancer, organized within the frame of the lung cancer consortium (LC3), funded by US NCI. The latter study includes 11000 cases and controls recruited from 20 centers, in Europe, US, Asia and Australia. Publications last 5 years, involving analyses carried out by BEVITAL. 1. Fanidi, A., Muller, D.C., Yuan, J.M., Stevens, V.L., Weinstein, S.J., Albanes, D., Prentice, R., Thomsen, C.A., Pettinger, M., Cai, Q., et al. (2018). Circulating Folate, Vitamin B6, and Methionine in Relation to Lung Cancer Risk in the Lung Cancer Cohort Consortium (LC3). Journal of the National Cancer Institute 110: djx119. 2. Zuo, H., Nygard, O., Vollset, S.E., Ueland, P.M., Ulvik, A., Midttun, O., Meyer, K., Igland, J., Sulo, G., and Tell, G.S. (2018). Smoking, plasma cotinine and risk of atrial fibrillation: the Hordaland Health Study. Journal of internal medicine 283, 73-82. 3. Zuo, H., Ueland, P.M., Midttun, O., Vollset, S.E., Tell, G.S., Theofylaktopoulou, D., Travis, R.C., Boutron-Ruault, M.C., Fournier, A., Severi, G., et al. (2018). Results from the European Prospective Investigation into Cancer and Nutrition Link Vitamin B6 Catabolism and Lung Cancer Risk. Cancer research 78, 302-308. 4. Theofylaktopoulou, D., Midttun, O., Ueland, P.M., Meyer, K., Fanidi, A., Zheng, W., Shu, X.O., Xiang, Y.B., Prentice, R., Pettinger, M., et al. (2018). Impaired functional vitamin B6 status is associated with increased risk of lung cancer. International journal of cancer 142, 2425-2434. 5. Degerud, E., Nygard, O., de Vogel, S., Hoff, R., Svingen, G.F.T., Pedersen, E.R., Nilsen, D.W.T., Nordrehaug, J.E., Midttun, O., Ueland, P.M., et al. (2018). Plasma 25-Hydroxyvitamin D and Mortality in Patients With Suspected Stable Angina Pectoris. The Journal of clinical endocrinology and metabolism 103, 1161-1170. 6. Zuo, H., Tell, G.S., Ueland, P.M., Nygard, O., Vollset, S.E., Midttun, O., Meyer, K., and Ulvik, A. (2018). The PAr index, an indicator reflecting altered vitamin B-6 homeostasis, is associated with long-term risk of stroke in the general population: the Hordaland Health Study (HUSK). The American journal of clinical nutrition 107, 105-112. 7. Christensen, M.H.E., Fadnes, D.J., Rost, T.H., Pedersen, E.R., Andersen, J.R., Vage, V., Ulvik, A., Midttun, O., Ueland, P.M., Nygard, O.K., et al. (2018). Inflammatory markers, the tryptophan-kynurenine pathway, and vitamin B status after bariatric surgery. PloS one 13, e0192169. 8. Agudelo, L.Z., Ferreira, D.M.S., Cervenka, I., Bryzgalova, G., Dadvar, S., Jannig, P.R., Pettersson-Klein, A.T., Lakshmikanth, T., Sustarsic, E.G., Porsmyr-Palmertz, M., et al. (2018). Kynurenic Acid and Gpr35 Regulate Adipose Tissue Energy Homeostasis and Inflammation. Cell metabolism 27, 378-392 e375. 9. Gao, J., Meyer, K., Borucki, K., and Ueland, P.M. (2018). 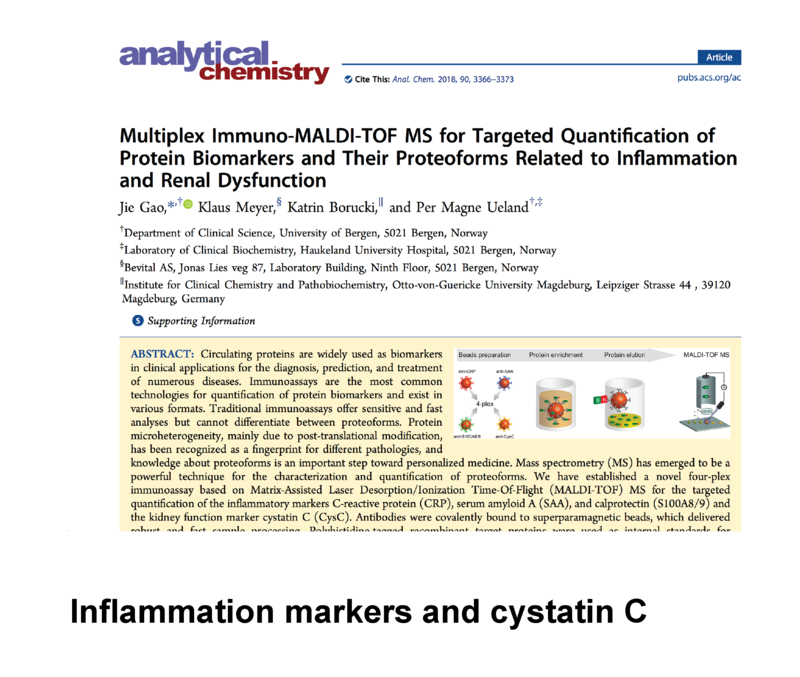 Multiplex Immuno-MALDI-TOF MS for Targeted Quantification of Protein Biomarkers and Their Proteoforms Related to Inflammation and Renal Dysfunction. Analytical chemistry 90, 3366-3373. 10. Mjelva, O.R., Svingen, G.F.T., Pedersen, E.K.R., Seifert, R., Kvaloy, J.T., Midttun, O., Ueland, P.M., Nordrehaug, J.E., Nygard, O., and Nilsen, D.W.T. (2018). Fibrinogen and Neopterin Is Associated with Future Myocardial Infarction and Total Mortality in Patients with Stable Coronary Artery Disease. Thrombosis and haemostasis 118, 778-790. 11. Sole-Navais, P., Salat-Batlle, J., Cavalle-Busquets, P., Fernandez-Ballart, J., Ueland, P.M., Ballesteros, M., Ornosa-Martin, G., Ingles-Puig, M., Colomina, J.M., and Murphy, M.M. (2018). Early pregnancy folate-cobalamin interactions and their effects on cobalamin status and hematologic variables throughout pregnancy. The American journal of clinical nutrition 107, 173-182. 12. Brosnan, J.T., Mills, J.L., Ueland, P.M., Shane, B., Fan, R., Chiu, C.Y., Pangilinan, F., Brody, L.C., Brosnan, M.E., Pongnopparat, T., et al. (2018). Lifestyle, metabolite, and genetic determinants of formate concentrations in a cross-sectional study in young, healthy adults. The American journal of clinical nutrition 107, 345-354. 13. Zuo, H., Nygard, O., Ueland, P.M., Vollset, S.E., Svingen, G.F.T., Pedersen, E.R., Midttun, O., Meyer, K., Nordrehaug, J.E., Nilsen, D.W.T., et al. (2018). Association of plasma neopterin with risk of an inpatient hospital diagnosis of atrial fibrillation: results from two prospective cohort studies. Journal of internal medicine 283, 578-587. 14. Muller, D.C., Hodge, A.M., Fanidi, A., Albanes, D., Mai, X.M., Shu, X.O., Weinstein, S.J., Larose, T.L., Zhang, X., Han, J., et al. (2018). No association between circulating concentrations of vitamin D and risk of lung cancer: an analysis in 20 prospective studies in the Lung Cancer Cohort Consortium (LC3). Annals of oncology : official journal of the European Society for Medical Oncology 29, 1468-1475. 17. Dhar, I., Lysne, V., Seifert, R., Svingen, G.F.T., Ueland, P.M., and Nygard, O.K. (2018). Plasma methionine and risk of acute myocardial infarction: Effect modification by established risk factors. Atherosclerosis 272, 175-181. 18. Zuo, H., Svingen, G.F.T., Tell, G.S., Ueland, P.M., Vollset, S.E., Pedersen, E.R., Ulvik, A., Meyer, K., Nordrehaug, J.E., Nilsen, D.W.T., et al. (2018). Plasma Concentrations and Dietary Intakes of Choline and Betaine in Association With Atrial Fibrillation Risk: Results From 3 Prospective Cohorts With Different Health Profiles. Journal of the American Heart Association 7: e008190. 19. Myte, R., Gylling, B., Haggstrom, J., Schneede, J., Lofgren-Burstrom, A., Huyghe, J.R., Hallmans, G., Meyer, K., Johansson, I., Ueland, P.M., et al. (2018). One-carbon metabolism biomarkers and genetic variants in relation to colorectal cancer risk by KRAS and BRAF mutation status. PloS one 13, e0196233. 20. Hoel, H., Hove-Skovsgaard, M., Hov, J.R., Gaardbo, J.C., Holm, K., Kummen, M., Rudi, K., Nwosu, F., Valeur, J., Gelpi, M., et al. (2018). Impact of HIV and Type 2 diabetes on Gut Microbiota Diversity, Tryptophan Catabolism and Endothelial Dysfunction. Scientific reports 8, 6725. 21. Parr, C.L., Magnus, M.C., Karlstad, O., Holvik, K., Lund-Blix, N.A., Haugen, M., Page, C.M., Nafstad, P., Ueland, P.M., London, S.J., et al. (2018). Vitamin A and D intake in pregnancy, infant supplementation, and asthma development: the Norwegian Mother and Child Cohort. The American journal of clinical nutrition 107, 789-798. 22. Dhar, I., Svingen, G.F.T., Pedersen, E.R., DeRatt, B., Ulvik, A., Strand, E., Ueland, P.M., Bonaa, K.H., Gregory, J.F., and Nygard, O.K. (2018). Plasma cystathionine and risk of acute myocardial infarction among patients with coronary heart disease: Results from two independent cohorts. International journal of cardiology 266, 24-30. 23. Huang, J.Y., Butler, L.M., Midttun, O., Ulvik, A., Wang, R., Jin, A., Gao, Y.T., Ueland, P.M., Koh, W.P., and Yuan, J.M. (2018). A prospective evaluation of serum kynurenine metabolites and risk of pancreatic cancer. PloS one 13, e0196465. 24. Midttun, O., Ulvik, A., Nygard, O., and Ueland, P.M. (2018). Performance of plasma trigonelline as a marker of coffee consumption in an epidemiologic setting. The American journal of clinical nutrition 107, 941-947. 25. Chandyo, R.K., Ulak, M., Kvestad, I., Hysing, M., Shrestha, M., Ranjitkar, S., Ulvik, A., Ueland, P.M., Shrestha, L., and Strand, T.A. (2018). Cobalamin and Folate Status among Breastfed Infants in Bhaktapur, Nepal. Nutrients 10. 26. Gylling, B., Myte, R., Ulvik, A., Ueland, P.M., Midttun, O., Schneede, J., Hallmans, G., Haggstrom, J., Johansson, I., Van Guelpen, B., et al. (2019). One-carbon metabolite ratios as functional B-vitamin markers and in relation to colorectal cancer risk. International journal of cancer 144, 947-956. 27. Larose, T.L., Guida, F., Fanidi, A., Langhammer, A., Kveem, K., Stevens, V.L., Jacobs, E.J., Smith-Warner, S.A., Giovannucci, E., Albanes, D., et al. (2018). Circulating cotinine concentrations and lung cancer risk in the Lung Cancer Cohort Consortium (LC3). International journal of epidemiology 47, 1760-1771. 28. Varsi, K., Ueland, P.M., Torsvik, I.K., and Bjorke-Monsen, A.L. (2018). Maternal Serum Cobalamin at 18 Weeks of Pregnancy Predicts Infant Cobalamin Status at 6 Months-A Prospective, Observational Study. The Journal of nutrition 148, 738-745. 29. Svingen, G.F.T., Zuo, H., Ueland, P.M., Seifert, R., Loland, K.H., Pedersen, E.R., Schuster, P.M., Karlsson, T., Tell, G.S., Schartum-Hansen, H., et al. (2018). Increased plasma trimethylamine-N-oxide is associated with incident atrial fibrillation. International journal of cardiology 267, 100-106. 30. Strand, T.A., Ulak, M., Kvestad, I., Henjum, S., Ulvik, A., Shrestha, M., Thorne-Lyman, A.L., Ueland, P.M., Shrestha, P.S., and Chandyo, R.K. (2018). Maternal and infant vitamin B12 status during infancy predict linear growth at 5 years. Pediatric research 84, 611-618. 31. O'Reilly, J., Pangilinan, F., Hokamp, K., Ueland, P.M., Brosnan, J.T., Brosnan, M.E., Brody, L.C., and Molloy, A.M. (2018). The impact of common genetic variants in the mitochondrial glycine cleavage system on relevant metabolites. Molecular genetics and metabolism reports 16, 20-22. 32. Olsen, T., Vinknes, K.J., Svingen, G.F., Pedersen, E.R., Dhar, I., Tell, G.S., Blomhoff, R., Ueland, P.M., Midttun, O., Refsum, H., et al. (2018). The risk association of plasma total homocysteine with acute myocardial infarction is modified by serum vitamin A. European journal of preventive cardiology 25, 1612-1620. 33. Magnus, M.C., Tapia, G., Olsen, S.F., Granstrom, C., Marild, K., Ueland, P.M., Midttun, O., Svensson, J., Johannesen, J., Skrivarhaug, T., et al. (2018). Parental Smoking and Risk of Childhood-onset Type 1 Diabetes. Epidemiology 29, 848-856. 34. Helm, T., Varsi, K., Flotre, C.H., Lund, A., Svingen, G.F.T., Ueland, P.M., and Bjorke-Monsen, A.L. (2018). Plasma Homoarginine Concentrations According to Use of Hormonal Contraception. Scientific reports 8, 12217. 35. Drotningsvik, A., Midttun, O., McCann, A., Ueland, P.M., Hogoy, I., and Gudbrandsen, O.A. (2018). Dietary intake of cod protein beneficially affects concentrations of urinary markers of kidney function and results in lower urinary loss of amino acids in obese Zucker fa/fa rats. The British journal of nutrition 120, 740-750. 36. Borowczyk, K., Piechocka, J., Glowacki, R., Dhar, I., Midtun, O., Tell, G.S., Ueland, P.M., Nygard, O., and Jakubowski, H. (2019). Urinary excretion of homocysteine thiolactone and the risk of acute myocardial infarction in coronary artery disease patients: the WENBIT trial. Journal of internal medicine 285, 232-244. 37. Bjorndal, B., Bruheim, I., Lysne, V., Ramsvik, M.S., Ueland, P.M., Nordrehaug, J.E., Nygard, O.K., and Berge, R.K. (2018). Plasma choline, homocysteine and vitamin status in healthy adults supplemented with krill oil: a pilot study. Scandinavian journal of clinical and laboratory investigation 78, 527-532. 38. Vollsaeter, M., Halvorsen, T., Markestad, T., Oymar, K., Ueland, P.M., Meyer, K., Midttun, O., and Bjorke-Monsen, A.L. (2018). Renal function and blood pressure in 11 year old children born extremely preterm or small for gestational age. PloS one 13, e0205558. 39. Bassett, J.K., Brinkman, M.T., Dugue, P.A., Ueland, P.M., Midttun, O., Ulvik, A., Bolton, D., Southey, M.C., English, D.R., Milne, R.L., et al. (2019). Circulating concentrations of B group vitamins and urothelial cell carcinoma. International journal of cancer 144, 1909-1917. 40. Shane, B., Pangilinan, F., Mills, J.L., Fan, R., Gong, T., Cropp, C.D., Kim, Y., Ueland, P.M., Bailey-Wilson, J.E., Wilson, A.F., et al. (2018). The 677C-->T variant of MTHFR is the major genetic modifier of biomarkers of folate status in a young, healthy Irish population. The American journal of clinical nutrition 108, 1334-1341. 41. Dhar, I., Svingen, G.F.T., Ueland, P.M., Lysne, V., Svenningsson, M.M., Tell, G.S., and Nygard, O.K. (2018). Plasma Cystathionine and Risk of Incident Stroke in Patients With Suspected Stable Angina Pectoris. Journal of the American Heart Association 7, e008824. 42. Quist-Paulsen, E., Aukrust, P., Kran, A.B., Dunlop, O., Ormaasen, V., Stiksrud, B., Midttun, O., Ueland, T., Ueland, P.M., Mollnes, T.E., et al. (2018). High neopterin and IP-10 levels in cerebrospinal fluid are associated with neurotoxic tryptophan metabolites in acute central nervous system infections. Journal of neuroinflammation 15, 327. 43. Lund, A., Giil, L.M., Slettom, G., Nygaard, O., Heidecke, H., and Nordrehaug, J.E. (2018). Antibodies to receptors are associated with biomarkers of inflammation and myocardial damage in heart failure. International journal of cardiology 250, 253-259. 44. Bjork, M., Riedel, B., Spigset, O., Veiby, G., Kolstad, E., Daltveit, A.K., and Gilhus, N.E. (2018). Association of Folic Acid Supplementation During Pregnancy With the Risk of Autistic Traits in Children Exposed to Antiepileptic Drugs In Utero. JAMA neurology 75, 160-168. 45. Doolin, K., Allers, K.A., Pleiner, S., Liesener, A., Farrell, C., Tozzi, L., O'Hanlon, E., Roddy, D., Frodl, T., Harkin, A., et al. (2018). Altered tryptophan catabolite concentrations in major depressive disorder and associated changes in hippocampal subfield volumes. Psychoneuroendocrinology 95, 8-17. 46. Lai, J.S., Pang, W.W., Cai, S., Lee, Y.S., Chan, J.K.Y., Shek, L.P.C., Yap, F.K.P., Tan, K.H., Godfrey, K.M., van Dam, R.M., et al. (2018). High folate and low vitamin B12 status during pregnancy is associated with gestational diabetes mellitus. Clinical nutrition 37, 940-947. 2. Theofylaktopoulou, D., Midttun, O., Ueland, P. M., Meyer, K., Fanidi, A., Zheng, W., Shu, X. O., Xiang, Y. B., Prentice, R., Pettinger, M., Thomson, C. A., Giles, G. G., Hodge, A., Cai, Q., Blot, W. J., Wu, J., Johansson, M., Hultdin, J., Grankvist, K., Stevens, V. L., McCullough, M. M., Weinstein, S. J., Albanes, D., Ziegler, R., Freedman, N. D., Langhammer, A., Hveem, K., Naess, M., Sesso, H. D., Gaziano, J. M., Buring, J. E., Lee, I. M., Severi, G., Zhang, X., Stampfer, M. J., Han, J., Smith-Warner, S. A., Zeleniuch-Jacquotte, A., Le Marchand, L., Yuan, J. M., Wang, R., Butler, L. M., Koh, W. P., Gao, Y. T., Rothman, N., Ericson, U., Sonestedt, E., Visvanathan, K., Jones, M. R., Relton, C., Brennan, P., Johansson, M., and Ulvik, A. 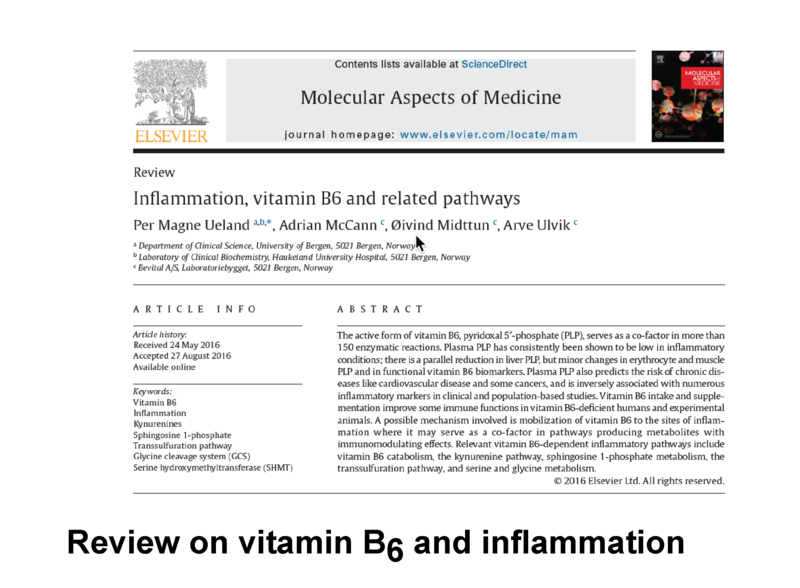 (2017) Impaired functional vitamin B6 status is associated with increased risk of lung cancer. International journal of cancer 142:2425-34.